Brown writes each character in this thrilling epic fantasy with passion and heart, and within the action and suspense are tales of love and loss. The clash of two immortal kings is felt throughout the realm in Feast of Fates by Christian A. Brown. 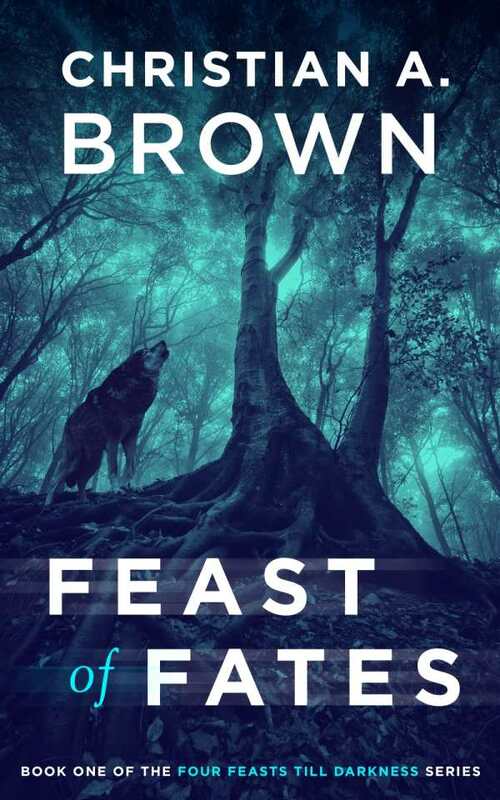 No tired story lines or boring characters here; Brown has created a thrilling, action-packed fantasy suffused with elements of folklore and legend, and spiced with a bit of metal magic for some steampunk flair. Geadhain is on the brink of an all-out war, and the fates and prophecies seem bleak. The peaceful kingdoms of Eod and Zioch, led by mystical brothers Magnus and Brutus, are in danger; a mysterious dark force is invading from within. To the east, the ever-menacing city of Menos looms, led by the Iron Queen as she waits for revenge and watches for a chance to strike. Heroes, heroines, villains, sages, sorcerers, knights, kings, witches, thieves, necromancers, and shape-shifters converge in a plentiful cast, each with a unique history, voice, and role to play in Feast of Fates. No one is quite who they seem, and when a humble sorcerer’s errand girl, Morigan Lostarot, whirls into the Wolf’s blacksmith shop, the gears of fate put into motion an unstoppable force. Across the realm in Menos, “a grim metropolis of dark metal towers that stabbed at a polluted sky as if in hatred of its existence,” Mouse, a professional messenger focused only on survival, stumbles into her own nightmare and, later, redemption when the Broker—part metal, part man, and all monster—takes notice of her on the same day the queen’s mad son decides she has a darker destiny. Brown writes each character with passion and heart, and within the action and suspense are tales of love and loss. The events unfold neatly in two parts. Each chapter is further subdivided into sections marked with Roman numerals, and prologue-epilogue bookends tie everything together. Brown’s organization and pacing allow every stage to unfold naturally, and despite the many flashbacks, subplots, twists, and turns, the events remain clear as the narrative marches forward. There is some confusion in the usage of commas, semicolons, and colons, but since each prompts a natural pause, it does not hinder the cadence. However, the improper usages may stand out to punctuation perfectionists. At a glance, Feast of Fates seems like pure fantasy, but there are also traces of science fiction, paranormal romance, action/adventure, and even a historical feel for those who enjoy knights and queens and kingdoms. Strong female leads and equally intriguing male characters ensure that Feast of Fates will have mass appeal.